We have noticed that most DC-area brides and grooms get ready in the hotel where other parts their wedding will take place. The wedding reception at the very least, if not wedding ceremony as well. This makes perfect sense to DC wedding photographers like us, of course. Many hotels offer brides- and grooms-to-be special rooms for booking the Washington wedding venue for their nuptials. There is also the convenience of getting ready in the same place where the future spouses will celebrate their wedding. It is much easier to head upstairs at the end of a long night than to travel to another location. Many luxury hotels in the Washington, DC, metro area have sumptuous interiors making pictures of fiancés getting ready look fantastic. Any Washington, DC, wedding photographer would say there is no need to go elsewhere to prepare for the marriage celebrations! We do always enjoy, however, when DC-area brides and grooms change things up a bit. Choosing to do the pre-ceremony preparations at a different site in Washington, DC, can be a great idea. One cool trend that we have observed is grooms getting cleaned up and dressed at old-school barbershops/mens clubs. These DC institutions generally offer straight-razor shaves and other pre-wedding grooming. They also typically have lounge areas where the groom and his groomsmen play pool and get prepared for the wedding ceremony. Many even have a bar where the Washington wedding party can have a drink or two to calm their nerves. It is not surprising to DC wedding photographers that grooms like the idea of relaxing with their groomsmen in places like this. Spending time in a quiet and comfortable environment before the bustle of a Washington, DC, marriage ceremony is often priceless. One such barbershop/mens club where we have taken photographs is the Quinntessential Gentleman (or the QG) in Baltimore, Maryland. The name is misspelled intentionally to honor the owner’s mother. It was she who inspired him to both act like a gentleman and to open a business celebrating that culture. Located just a few blocks from Baltimore’s famous Inner Harbor, the QG opened its doors in 2005. It began as a barbershop offering a sophisticated take on the old-fashioned approach to mens grooming. Since then, the QG has expanded its services to include a spa, a cigar lounge, a bar, a restaurant and an upscale men’s clothing store. Grooms who book the Quinntessential Gentleman for their pre-wedding preparations can start with a classic hot-towel and straight-razor shave. That is what the groom pictured in this image did. We loved photographing that part of his getting-ready process. It gave us unique wedding photos that we could not have gotten at more traditional hotel venues. Producing images that are unique is special is always a goal for us. We want our Washington-area brides and grooms to get pictures that stand out and show how special their wedding was. So we appreciate the opportunities that unique venues like the QG give us to create new and different wedding photography. After his shave, the groom returned to the Clubhouse to join his groomsmen in getting dressed for the wedding. The Clubhouse is a private area built around a pool table. It is also equipped with a TRUGOLF golfing simulator, several old-school arcade video games and a massive TV. 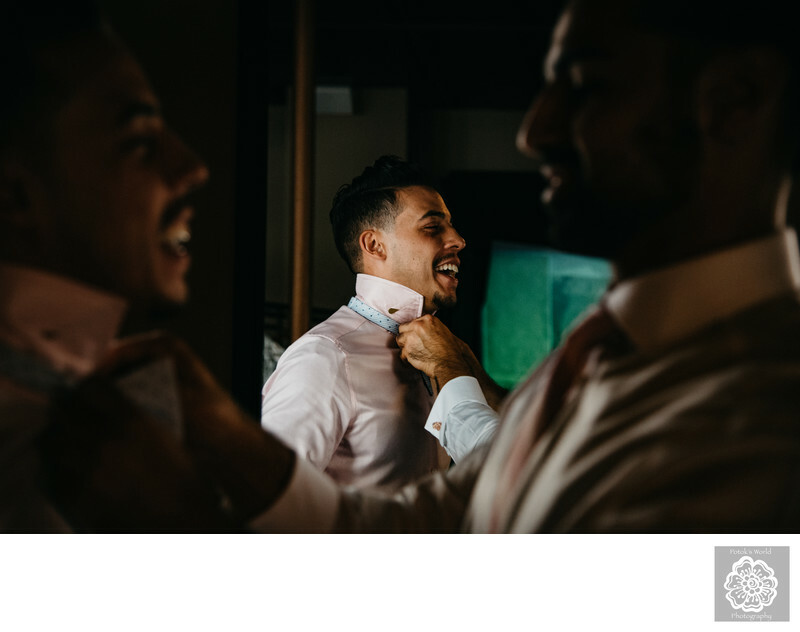 As he got ready, this Baltimore groom asked each of his groomsman assist him in putting on one thing. One helped him into his shoes, for example. Another fixed his cufflinks, and the groomsman in this photo worked on his tie. It was a nice way to get all of the members of his wedding party involved in the Baltimore marriage celebrations. The gesture clearly made them feel more a part of his nuptials. It also acknowledged the importance of them supporting him on such an important occasion. Location: The QG, 31 S Calvert St, Baltimore, MD 21202.